This installment of the Call to Arms-series clocks in at 32 pages, 1 page front cover, 1 page editorial, 1 page ToC, 1 page SRD, 1 page advertisement, 1 page back cover, leaving us with 26 pages of content, so let’s take a look! 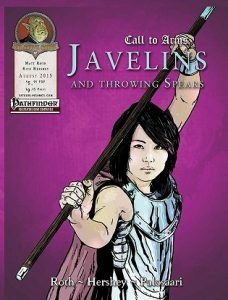 After a fluffy introduction, we dive right into a brief history of the javelin and similar throwing spears and their use throughout history, acting as complimentary means of softening up the foe or for skirmish tactics; following these observations, we distinguish between light and heavy javelins, with light javelins being designated as the standard as depicted in PFRPG; and just because javelins were auxiliary weapons in real life does not mean they have to be that in PFRPG – thus, we begin with new special weapon qualities to apply to the weapons and make them more desirable; durable weapons are, for example, not destroyed when an effect of their use would annihilate them (like a successful attack with a pilum) and have more hit points. The weapons thus don’t break and make, in spite of doubled costs, more sense from an adventuring point of view and brings the weapon type closer to the ammunition-based weapons in terms of upkeep costs. On the other side and mutually exclusive to that, pliant weapons are destroyed and thus can’t be thrown back at the user…and they cost less. Lightweight weapons increase their range increments by a factor of 1.5, but at the cost of -1 damage, while weighted weapons can be pictured as the javelin-answer to composite bows, with specific Strength-ratings in mind; the higher these are set, the more damage the spear causes…but the shorter its range becomes. Strength rating also doubles as a Strength modifier prerequisite, in case that was a bit opaque. These two, obviously, are also mutually exclusive. EDIT: As one of my readers had this question: weighted javelins and their Strength-rating add up to the rating beyond the usual bonus added; think of it as a composite bow-like effect added atop thrown weapons, simulating their greater penetrative power. Finally, weapons can be modified to be standardized, which means that qualities like pliant or durable are negated and weapons that usually break on impact no longer do so. Now one crucial problem for the javelin lies in its enchantment – either go returning or the one-use option – both have issues and the pdf seeks to handle these via weapon special abilities – a total of 5 such abilities are provided and they include a ricochet enchantment at +3 and the pretty crucial recursive ability that teleports the weapon in question back into the user’s hand, allowing for iterative attacks…but at a cost of +2, as opposed to returning‘s +1. Routing weapons can cause the targets to become shaken and, fret not, staggering weapons do not cause the condition of the same name; instead, they are effective versus charges and can force targets hit to move. Still, why call it like a condition that is an established rules-term? Odd. Unbalancing weapons, finally, penalize AC and CMD temporarily – and all in all, I like this section. It emphasizes the skirmishing aspects and while it does not perfectly solve the issues with javelins, it at least makes them more viable and in tune with their themes. The pdf also features specific weapons that range from 166 gp for +1 dragon bane pliant javelins to 128K in price range. The weapons featured include falarica and yes, weapon table wise, the book collates and expands types of weapons to include soliferrums, foe-piercing angons, shatterlances you can use to deliver poisons or incendiary material – and concept-wise, these are cool: There would be, for example, the immovable angon, adamantine-barbed, that keeps bleeding the target unless it removed; however, the rules-language becomes a bit odd, mentioning “anchored” and “transfixed” but sans specifying how that is supposed to work; the base angon mentions “brutally pierced”, but neither of the two key-words…so no idea how exactly that one’s supposed to work. Is this supposed to require the new feat to transfix foes? Pretty unique: There are javelins that sap movement speed and convey it to the wielder. Also really cool: Phalanx End Pilums can negate shields and ricochet to deny more creatures the bonus conveyed by their shields. A hellish falarica is nice…but the weapon players will HATE is rustfang: Upon impact, it generates a cloud of rusty dust that quickly corrodes metal. VERY cool. Crystalline spears that can burst asunder to hit nearby targets also are pretty cool. As has become the tradition with the series, we also get cursed items (which I won’t spoil here) as well as a powerful intelligent item that may drain its victims of situational awareness, confusing the target and it also can call forth a powerful ally when the wielder commands an army/force. Otherwise, the weapon is a decent commander…though I wished it actually also had notes for use with Ultimate Campaign’s mass combat rules…but I’m nitpicking here. The mythic godlance quiver can be compelled to create powerful javelins by feeding it with mythic power and the artifact starpierce…has no range increment. Trailing a comet’s fire, it can LITERALLY be thrown from planet to plant, across continents…awesome. Oh, and the wielder may join the spear on its flight. Now this may well be my favorite artifact in the whole line so far: I can definitely see someone consulting an astronomer to find the *exact angle* to throw the spear to get to the moon/other planet. Or what about a powerful invader, coming down with the weapon? So damn cool! The pdf also provides 8 new feats for use in conjunction with javelins: Better defenses when foes try to sunder your shield, better throwing of weighed javelins, use in melee sans penalty…pretty nice. I’m weary of Priming Volley: Rendering a foe hit by a ranged weapon flat-footed for your follow-up melee attack is pretty strong…but not to the point where the feat on its own is problematic. Ranged weapon sunder attempts at twice the range penalty make sense to me and a great way to make these thrown weapons more feasible. Transfixing shots that entangle foes hit with a quasi-maneuver can be found here as well alongside two-handed throwing. The pdf also features the throwing spears weapon group and a new ranger and skirmisher style for the javelins – both interesting and with their own leitmotifs and themes…kudos for not just duplicating the styles for the classes. The pdf also features 3 archetypes: The Peltast fighter would be first and…surprisingly, I have nothing to complain here – with low level Shot on the Run access, an emphasis on skirmishing and movement and some soft target control, it’s a viable, nice archetype. The Jinete cavalier replaces cavalier’s charge melee focus with an emphasis on throwing and the means to hamper enemy movement as well as high-level circle charges sans approaching the enemy for the quintessential old-school version of run and gun. Overall, a solid javelin specialist. Finally, the almogavar ranger gets no animals, but he becomes the ranged/melee-combo guerrilla fighter. That is the least complex of the archetypes and perhaps the one that could have used some additional unique tricks. Now some of the best things that came of the Call to Arms-series are optional rules, so how does that chapter fare here? Well, for one, the pdf introduces bracing for javelins, which makes sense to me- Sold, will use.In campaigns with plenty of flying creatures, the optional rule to use javelins to severely restrict their flight capacity is welcome and provides some cinematic moments…oh, and the look on a player’s face is priceless, when their cool pegasus mount’s shot out of the air…while they’re still on it. Sure, I will user a finer-grained mechanic that assumes that creatures of a certain size require siege weapons to have a chance to be shot down…but yeah. The pdf acknowledges and encourages tweaking like this. The final rule is based on a tactic of my Frankish ancestors – throwing a weapon at a shield and then crashing into it to displace it (or cripple foes). Kudos for actually knowing that one. The pdf goes one step further, though: Two new army resources and 4 new tactics are presented for use with mass combat (YAY!!) and we also get 6 premade armies for our perusal – NICE!! Editing and formatting are pretty good and representative of Fat Goblin Games “new” era – i.e. both formal and rules-criteria are sufficiently detailed. While here and there I would have liked a bonus to by typed instead of untyped and the aforementioned glitch in an item persists, there is not much to complain. Layout adheres to the 2-column full-color standard established for the series and the pdf features some solid, mostly stock artwork. The pdf comes fully bookmarked for your convenience with detailed, nested bookmarks. Unless I am sorely mistaken, this is the first pdf penned by Matt Roth I have had the pleasure to review; and it indeed was a pleasure. I am not sure how much of this is due to the capable dev hands of Lucus Palosaari, but I do know that the result is impressive. While the book is not perfect, it is an excellent addition to the game and elevates from being a thoroughly poor choice to working as a flavorful option, particularly when used in conjunction with the optional rules mentioned. How to rate this, then? You see, here it becomes a bit more difficult. The pdf, as well made as it is, imho could have done a bit more to make the use of disposable throwing weapons more viable – a couple of enhancing quivers or the like could have gone a long way. That being said, this is still a very good file and deserves a final verdict of 4.5 stars, rounded up to 5 for the purpose of this platform. You can get this rather cool CtA-installment here on OBS! Unless I’m mistaken, Javelins, as throwing weapons, already recieve a bonus to damage equal to the throwers strength modifier, how does this interact with the weighted Javelins, an additional bonus of X if you have a strength mod of X? You’d be right. It basically adds the Str-mod again, up to the maximum modifier granted by the weighted javelin, basically simulating higher penetrative power beyond that of composite bows at shorter ranges.It’s basically like adding the composite bow’s composite trick atop a thrown weapon.